What’s with the current Zombie fad? After the Zombie of the Manor stunt comes this great stunt. A town called Bangor in New England held a Zombie Apocalypse Day. As well as having the side effect of attracting lots of media attention, the day was a serious attempt to show the public how to deal with an outbreak of a serious disease. In this case, the serious disease was a fictional zombie plague which had spread from Jamaica by bites. 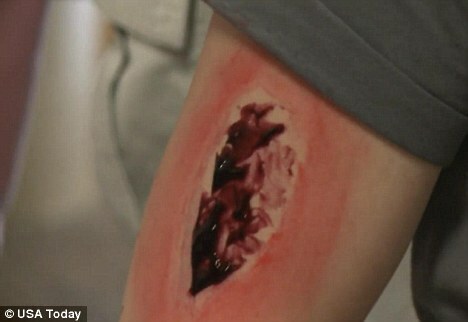 The zombies were given their blood-curdling appearance by Don Wade, a make-up expert who specialises in creating artificial wounds for medical and military training. This forced emergency workers to make decisions about how to ration out medicines and what to do when faced with mass fatalities. Organisers added twists, such as vigilante violence and theft of supplies, to reflect the sort of challenges posed by emergency situations.